This is a Telugu name; the family name is Allu. Allu Arjun is an Indian film actor who primarily works in Telugu cinema. After playing as a child artist in Vijetha and as a dancer in Daddy, Arjun made his adult debut in Gangotri. Arjun then appeared in Sukumar's debut film Arya. His role in Arya was his breakthrough, earning him his first Filmfare Best Telugu Actor Award nomination and he won a Special Jury award at the Nandi Awards ceremony, two CineMAA Awards for Best Actor and Best Actor Jury and the film was a critical and commercial success. He next starred in V. V. Vinayak's Bunny playing the role of Bunny, a college student. Critics praised his mannerisms and dancing. His next film was A. Karunakaran's musical love story Happy. He then starred in Puri Jagannadh's action film Desamuduru, in which he played the role of Bala Govindam, a fearless journalist who falls for a woman with a darker past. Arjun has won five Filmfare Awards South and two Nandi Awards. 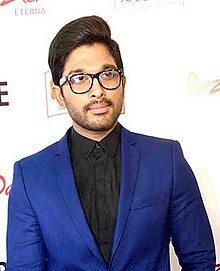 Allu Arjun was born in Chennai, Tamil Nadu to film producer Allu Aravind and Nirmala. His paternal grandfather was the film comedian Allu Ramalingaiah, while his paternal aunt is married to Chiranjeevi. On 6 March 2011, Arjun married Sneha Reddy in Hyderabad. He has a son named Ayaan and a daughter named Arha. In 2016, Allu Arjun started a nightclub named 800 Jubilee in collaboration with M Kitchens and Buffalo Wild Wings. After playing as a child artist in Vijetha and as a dancer in Daddy, Arjun made his adult debut in Gangotri. Arjun then appeared in Sukumar's comedy Arya. His role in Arya was his breakthrough, earning a first Filmfare Best Telugu Actor Award nomination and he won a Special Jury award at the Nandi Awards ceremony, two CineMAA Awards for Best Actor and Best Actor Jury and the film was a critical and commercial success. He next starred in V. V. Vinayak's Bunny playing the role of Bunny, a college student. Critics praised his efforts, mannerisms and dancing. His next film was A. Karunakaran's musical love story Happy. He then starred in Puri Jagannadh's action film Desamuduruin which he played the role of Bala Govindam, a fearless journalist who falls with a woman with a darker past. His next film was Bhaskar's Parugu, where he played the role of Krishna, a happy-go-lucky guy from Hyderabad who helps his friend to elope with his love, only to experience the wrath of the woman's father and the emotional struggle he felt. idlebrain.com wrote: "Allu Arjun is pretty excellent in the first half as the characterization in the first half is vibrant and needs loads of energy. He carried the entire first half on his shoulders. He excelled in the emotional scenes in the second half." After playing in a guest role in Shankar Dada Zindabad, he starred in Sukumar's psychological action drama Arya 2. He played the role of Arya, an orphan who is behaviorally sick in that he is consumed with possessiveness for his friend Ajay, who never accepts him. Sify wrote: "Allu Arjun is full of energy as the guy caught in the powerful current of love. Though he plays the part with negative shades, his characterization could evoke a lot of sympathy from the audiences. His dances are mind-blowing and he excels in emotional scenes." idlebrain.com wrote: "Allu Arjun is perfect as Arya. His character in the movie has the qualities of a psychotic and he portrayed the character flawlessly. He shined in emotional scenes in the second half of the movie. Allu Arjun is probably the best dancer of current era in Tollywood. That is the reason why he made hugely difficult dances appear fluid and effortless in the first four songs of the movie." Arjun starred in two experimental films in 2010. The first was Gunasekhar's Varudu. Rediff wrote: "Allu Arjun has put in a competent performance, subdued when necessary and volatile when needed." While Rediff stated: "He's a good dancer and does justice to his role." His next film was Krish's Vedam. His next release was V. V. Vinayak's action film Badrinath. He played the role of Badri, a warrior who is assigned to protect the shrine of Badrinath by his Guru, to whom he is very loyal. idlebrain.com wrote: "Allu Arjun has taken tremendous pain in traveling to Vietnam to learn south-east-Asian martial arts for this movie. All his hard work shows up in the movie where he appears more like a warrior from south-east-Asian regions (Chinese or Japanese) with a pony tail and leather gear (chest belt and shoes). He is amazing with fluid movements in the dances. He is good with fights." The movie completed a 50-day run in 187 centers. After Badrinath, Arjun appeared in the film Julayi, an action comedy that released in 2012. Arjun played the role of Ravindra Narayan, a street-smart yet spoilt brat whose life takes a drastic turn after he becomes the witness of a huge bank robbery. The Times of India wrote: "Allu Arjun puts in a confident performance as the loveable rogue. It's a role that is right up his alley and he carries it off with a characteristic panache. He lights up the screen with his dancing in particular, pulling off some pretty challenging dance moves." He was nominated for the SIIMA Award for Best Actor. He later starred in Puri Jagannadh's action thriller Iddarammayilatho, playing the role of Sanju Reddy, a guitarist with a dark past. The Times of India wrote: "True to his tag of "stylish star", Allu Arjun looks trendier than ever before. His character of a guitarist, who is a street performer in Barcelona, was at its best sketchy, and looks completely different from his previous films. He once again proves that he is a good actor and probably because of the action director's meticulous planning, he makes perfect expressions in all the fight scenes." In 2014, he appeared in a cameo in Vamsi Paidipally's Yevadu. The Hindu wrote: "Allu Arjun shows what an actor can do even in a short role, in the few minutes he packs his experience, internalises the character and makes an impressive exit even as he loses his identity." His next film was Surender Reddy's Race Gurram, in which he played the role of a carefree guy. The Deccan Chronicle wrote: "Allu Arjun definitely steals the show with his energetic performance. He is good with his comedy timing and has also improved a lot as an actor. He actually carries the film on his shoulders. His dancing skills are utilised well too." He won his third Filmfare Best Telugu Actor Award. Arjun produced and acted in a short film I Am That Change (2014), to spread awareness on individual social responsibility. The movie was directed by Sukumar, which was screened in theatres across Andhra Pradesh and Telangana on 15 August 2014. He acted in Trivikram Srinivas's S/O Satyamurthy, which was released on 9 April 2015. Later, he acted in Guna Sekhar's Rudhramadevi, which is the first Indian 3D historical film. For Rudhramadevi, he won the Filmfare Award for Best Supporting Actor – Telugu and became the only actor to win both the Filmfare Award for Best Actor - Telugu and the Filmfare Award for Best Supporting Actor - Telugu. Later, he acted in Sarainodu, directed by Boyapati Srinu. In 2016, he collaborated with producer Dil Raju for the third time for Duvvada Jagannadham. In 2018, his film under the direction of writer turned director Vakkantham Vamsi, Naa Peru Surya, Naa Illu India was released. In the film he acted as an Indian Army soldier who has anger management issues. According to Google, Arjun was the most searched Tollywood star in 2016. ^ "Forbes 2015 Celeb 100: Mahesh, Kamal, Rajini, Suriya, Rajamouli, Prabhas, Kajal, Shruti make it to list". International Business Times, India Edition. Retrieved 2015-12-12. ^ a b A. S., Sashidhar (28 March 2003). "Review : Gangothri". Sify. Archived from the original on 14 March 2015. Retrieved 14 March 2015. ^ a b "Gangotri 100 days centers". idlebrain.com. Archived from the original on 24 September 2015. ^ a b "Arya – A cocktail of fun and more fun". IndiaGlitz. Retrieved 10 May 2004. ^ a b "Movie review – Arya". idlebrain.com. Retrieved 7 May 2004. ^ a b "`Anand' walks away with six Nandi awards". The Hindu. 10 October 2005. Archived from the original on 14 March 2015. Retrieved 14 March 2015. ^ a b "Allu Arjun's favourite film is Arya". The Times of India. 9 May 2014. Archived from the original on 14 March 2015. Retrieved 14 March 2015. ^ a b "Movie review – Bunny". idlebrain.com. Retrieved 6 April 2005. ^ a b "Happy – Study of love". IndiaGlitz. Retrieved 28 January 2006. ^ a b "Desamuduru – Allu Arjun is now a macho man". IndiaGlitz. Retrieved 12 January 2007. ^ "Allu Arjun's starry wedding". The Times of India. Retrieved 8 March 2011. ^ "Allu Arjun Into Night Club Business". 25 July 2016. ^ "Telugu Movie review – Parugu". idlebrain.com. Retrieved 1 May 2008. ^ "Movie Review : Arya 2". Sify.com. Retrieved 27 November 2009. ^ "Telugu Movie review – Arya 2". idlebrain.com. Retrieved 27 November 2009. ^ "Worth a watch". Rediff.com. Retrieved 31 March 2010. ^ "Telugu Movie review – Badrinath". idlebrain.com. Retrieved 10 June 2011. ^ "Badrinath completes 50days in 187 theatres". The Times of India. Retrieved 3 August 2011. ^ "Julayi movie review: Wallpaper, Story, Trailer at The Times of India". The Times of India. Retrieved 9 August 2012. ^ "Iddarammayilatho Telugu movie review highlights". The Times of India. Retrieved 31 May 2013. ^ "Allu Arjun and Kajal spotted on the sets". The Times of India. 18 April 2013. Retrieved 18 April 2013. ^ Y. Sunitha Chowdary (13 January 2014). "Yevadu: Tailored for the masses". The Hindu. Retrieved 21 February 2014. ^ "Allu Arjun's Race Gurram shooting started". Oneindia Entertainment. Retrieved 30 April 2013. ^ "Movie review 'Race Gurram': A total paisa vasool flick". Deccan Chronicle. 12 April 2014. Retrieved 28 July 2014. ^ "Winners list: 62nd Britannia Filmfare Awards (South)". The Times of India. 27 June 2015. Archived from the original on 27 June 2015. Retrieved 27 June 2015. ^ "Allu Arjun's new film rolls out". The Times of India. 23 September 2014. Archived from the original on 31 October 2014. Retrieved 23 September 2014. ^ "I struggled to produce the short film: Allu Arjun". The Times of India. 14 August 2014. Retrieved 15 August 2014. ^ "Allu Arjun gets into an action mode for Trivikram's film". The Times of India. 29 October 2014. Retrieved 11 January 2015. ^ "Exclusive: Allu Arjun- Boyapati Srinu movie details". iluvcinema.in. 25 April 2015. Retrieved 3 August 2015. ^ "SEE PIC: Allu Arjuns Na Peru Surya Na Illu India starts rolling". Retrieved 10 October 2017. ^ "Allu Arjun was the most searched Tollywood star in 2016 online". Times of India. 16 January 2017. Retrieved 6 September 2018.